Why is it when friends come to visit...............from thousands of miles away no less, the weather is crappy? When I visited Paula last month, California was unusually cold and very wet. This weekend, when she headed East, bringing her daughter Julie with her so we could spend a Spring weekend on North Carolina turf..............not only was it damp and very chilly, this morning it was actually snowing and sleeting!!!!! Last week 90 degrees, this morning down to almost below freezing! 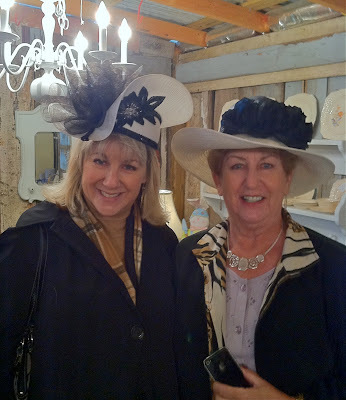 ................with time for Julie and Paula to try on vintage Easter bonnets! I'm missing them already. It may be a while until I catch up with Julie again, however, I'll see Paula in May....................when we're home in England visiting the Lake District in search of Peter Rabbit!! Yes, we hope to visit Beatrix Potter's Hill Top home......and cross the border into Scotland. Having never been that far North in the UK, I'm really excited about this upcoming trip. Just had to share what popped out in my garden during the past two extremely hot days here in the Piedmont area of North Carolina! The wisteria on the arbor, dead looking twigs last week, tiny green buds on Sunday.......and glory be, beautiful, sweet perfumed, dangling blossoms this morning. Nature is full of surprises. Also today, the one small dogwood tree remaining in the back garden is covered with delicate flowers. They usually bloom before the leaves but I think the heat of yesterday (90 degrees!) turned everything in the garden topsy-turvy.................the leaves are already visible! The pretty five-leaf Akebia vine is flourishing - several small purple flowers are showing. There is a second plant climbing on the other side, it's been struggling for several years but appears to be in good shape this Spring. 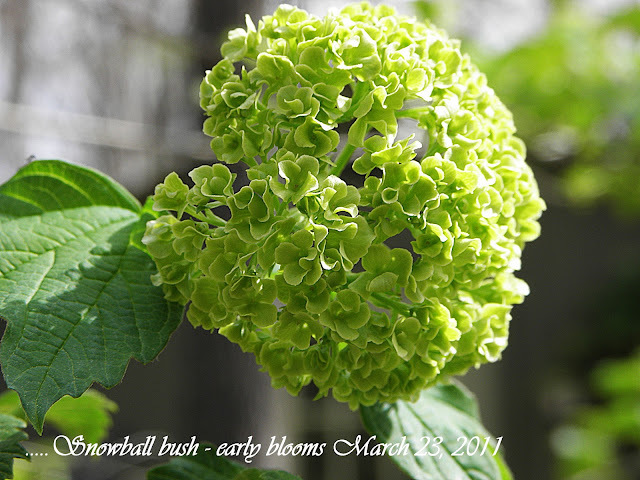 Here you can also see the Snowball bush with its soft green balls - they will turn white as they grow. This shrub was just a couple of feet tall when I planted it two years ago, now it's about nine feet - definitely a fast grower. 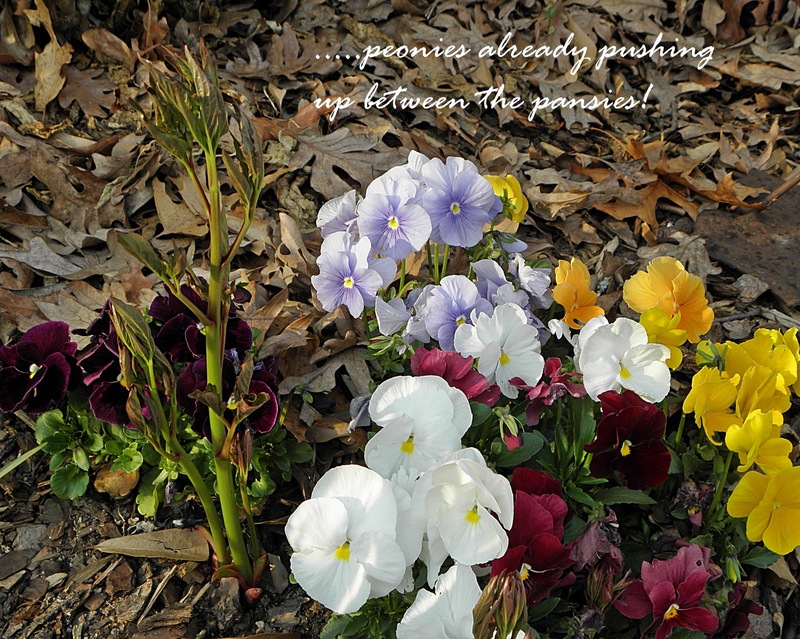 I can even see early azaleas blooming in my neighbor's garden, mine are budding but no flowers yet - I just know there will be a great show in time for Easter. Well I'm definitely thrilled to see the garden with some color as I have company coming from California this weekend.....................my best friend Paula, fresh from an awesome cruise on Africa's West coast (bring pics Paula! ), and her daughter Julie, who hasn't visited North Carolina in many years. 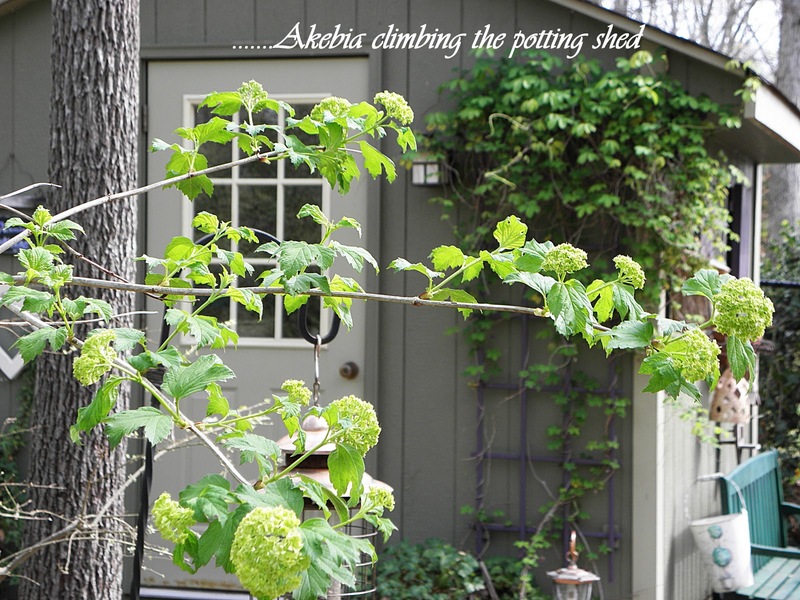 I'll be taking a short blog break this weekend.......back next week with more on my upcoming new space at SuzAnna's Antiques. P.S. My DH is also coming back from a business trip to California, SO late tomorrow night it will actually be morning here when he lands! You just know how I love those airport pickup trips IN THE MIDDLE of the night!!!! What one does for love! .......and there's plenty of green of every shade making the arrival of Spring the subject of daily conversation. Love the unusual green roses on this vintage dish. I love what dealer Sam has been up to.........designing and making spectacular Spring nature scenes under glass. The tall stemmed container is a favorite - several to choose from - and would make a very attractive table centerpiece mixed in with other treasures. ...............and last, but by no means least..........sweet Rhonda who works part-time at SuzAnna's Antiques, dressed not only in Spring green at the recent vintage fashion show, but also wore the most incredible piece of beaded jewelry I've ever seen. 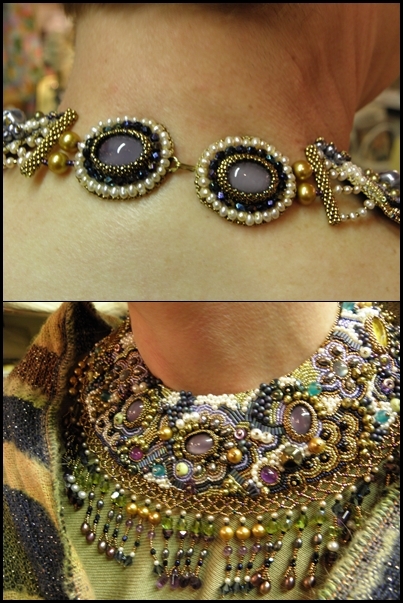 This beautiful collar necklace took her about 100 hours to stitch..........even the clasp is astounding. You'll have to admit this was a true labor of love....and she made it up as she went, no pattern or sketch to follow. I'm always amazed at talent such as this, a one of a kind stunning creation, a museum quality piece.....you rock Rhonda!! Thanks Rhonda for allowing me to share your amazing jewels! Every thing's coming up tulips! 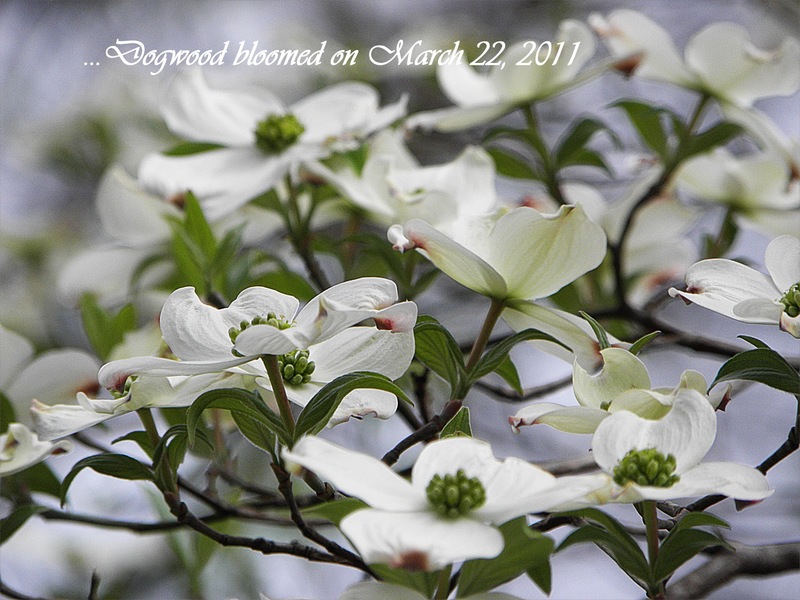 Open season for Spring blooms here in North Carolina. Above, how they looked just opening early last week. Note they are in pots - I no longer plant rather expensive tulip bulbs in the ground where they feed our visiting wildlife! Taken yesterday, following a very warm weekend, the tulips have really grown. ...............parsley, ready for clipping for the kitchen and adding to dishes. Pretty purple Thrift blooming, bluebell leaves will soon be surrounding deep blue bell flowers, one of my favorites in the Spring garden. Pansies thriving.......had no idea I'd planted them on top of a peony last Fall! At the Vintage Village where SuzAnna's Antiques is located, my other favorite place to shop for treasures is Two Old Birds. Delightful sisters, Susan and Debbie, are always adding wonderful items to their mix of antiques, collectibles, and vintage - they also do Home Staging. When I see their OPEN sign out front I know my day will include a fun visit to their cute shop. They'll soon be starting their garden in front of the shop - potting benches, chicken coops, and an array of quirky containers will soon be massed with colorful plants - Susan, also a florist, and Debbie, always wow us with their gardening skills. Update: Not a thing crossed off my wish list at Saturday's community Yard Sale...........however, if you needed a baby stroller or a set of bunk beds, it would have been the place to go! My hunting for treasure continues. Well dear readers, life continues to be hectic around these parts, always something new and creative going on. If I haven't stopped by to see you lately, please be forgiving, I just need more hours in my day, you know that feeling well I'm sure. Big changes coming end of month at SuzAnna's Antiques..........Vanessa and I are expanding into the booth next to our current space so will have double the room to play shop in! We have decided to keep the dividing wall for now - made of lovely chippy old doors, it provides a nice place to hang art, frames, mirrors etc. This means we can each have our own area to decorate and display our treasures, including larger pieces of furniture. We are very excited and grateful to Susie and Jenny for giving us this opportunity - thanks dear friends! These two painted pieces, in their temporary home in front of my armoire, will be moving to my booth soon. Sam, my friend the antiques guru, painted the beautiful mahogany table - there are actually a pair but I'm keeping one for myself! The decorative carving along the base is lovely, and those original French style pulls are perfect. I purchased the chair this week at another antiques shop...............the seat was upholstered in a wild bird print so today I redid it using a French grain sack of heavy textured linen hemp with a dark stripe, much better. 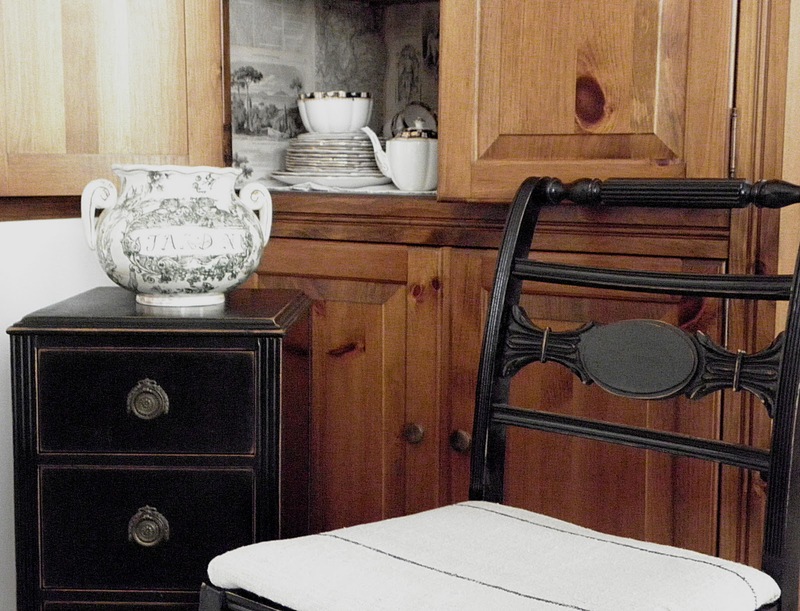 I'm debating whether to add a number in French script to the oval medallion on the chair back. This seems to be a popular style, however, as DH said, perhaps better to leave it blank and the lucky person who takes this sweet chair home can add a number that has a special meaning to them perhaps. My husband, the non-decorator..........but pragmatic businessman! SuzAnna's Antiques is really warming up now that Spring is here................soon I'll share more pics of the treasures available........meanwhile I'm off to a huge neighborhood yard sale this morning. ..............and whatever else catches my eye. The seafront promenade, before the Summer tourists invade. My beautiful home town in England - Torquay, South Devon. .........and we didn't, because that's how life was then. 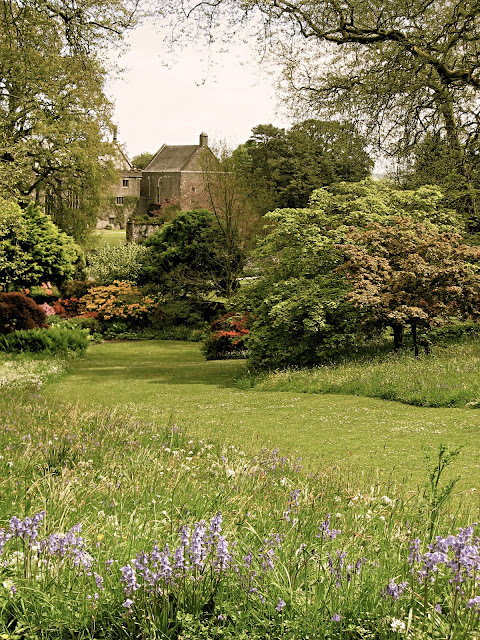 English gardens............no place lovelier on a Spring afternoon. This is part of the Dartington Estate, Devon - the month of May brings bluebells and azaleas. 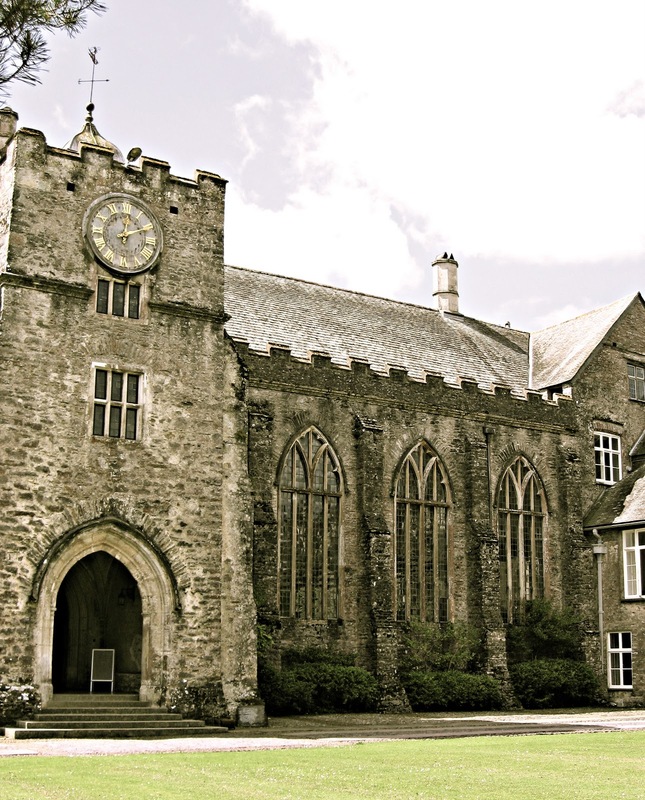 For more on the very interesting history of the Dartington Estate go here. The ubiquitous English tearoom. Still a respite in the busy day...........the never ending part of British heritage known as 'teatime', when we are still able to drop everything, put on the kettle, and sit down with a nice cup of tea, preferably with good company, be it family or friends. Angels is my favorite, even on a rainy afternoon.........on the cliff top, looking toward the English Channel, Victorian in decor, angels and lace, with a lovely garden area set with tables and chairs. 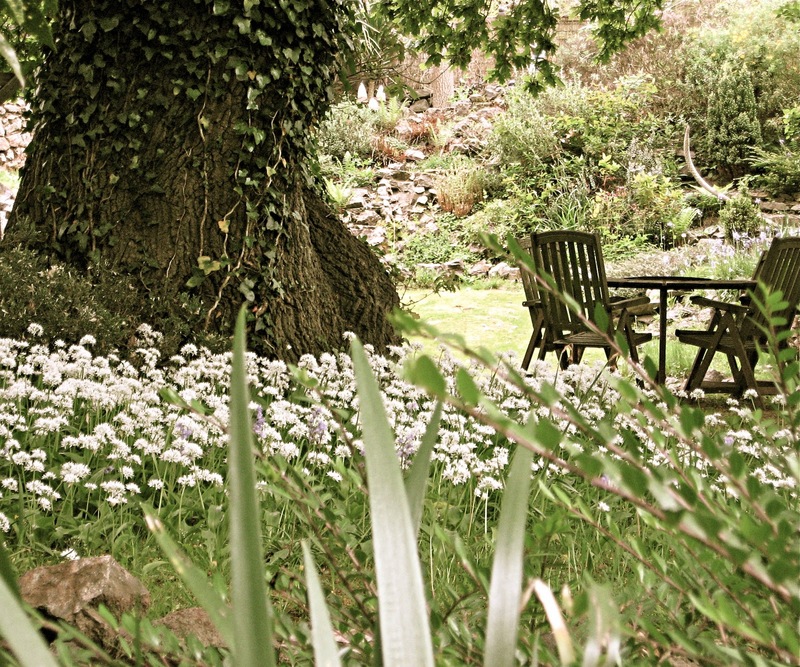 A garden where a cup of tea would be enjoyable on a Spring afternoon. 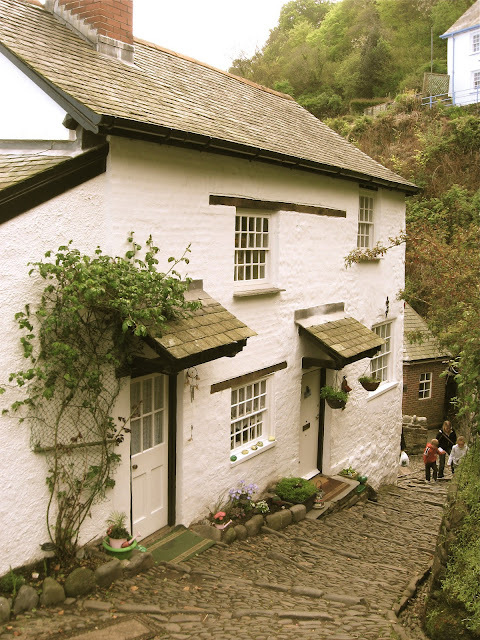 The thatched Weavers Cottage 'tea shoppe' in the tiny village of Cockington. 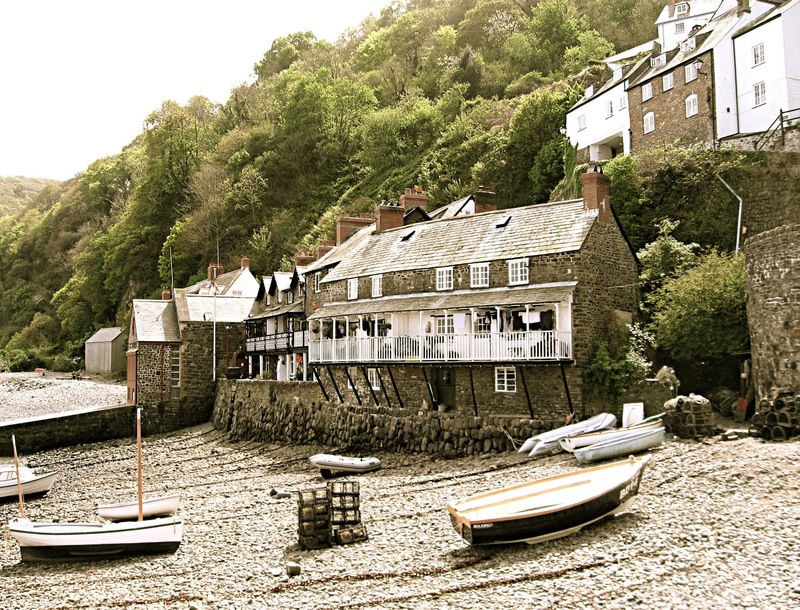 This was the village where I spent many a happy day in my childhood.......within walking distance of my home, perhaps 3.5 miles round trip, with two fairly steep lanes to climb, just a quick jaunt in those days! No, I'm not over there yet! I will be going home again in May. Looking forward to it. These are images from my 2009 visit. Sharing more images of places dear to me at home in England. 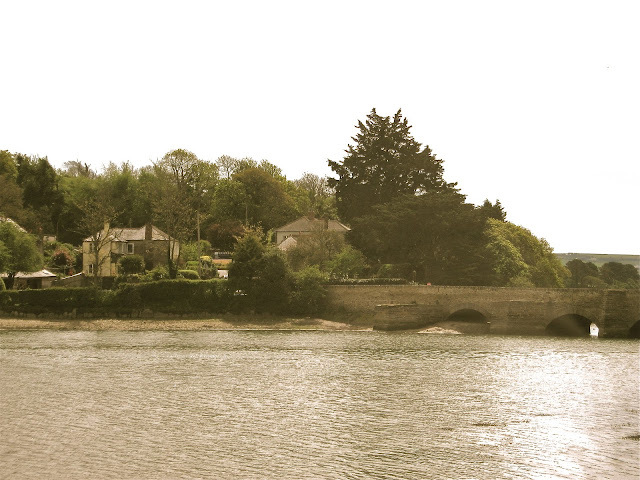 I'm learning to edit on my MacBook so decided to give these photos, taken on my last trip home in 2009, a vintage look - seeing as how I'm now a vintage age! Rivers played a big part in my early life, mostly for recreation on the weekends. We seemed to spend a lot of time near them, crossing them, admiring, and enjoying them. The sea was at our doorstep so we weren't lacking for watery vistas, but Sunday rides with friends who had motor cars always led to rivers. 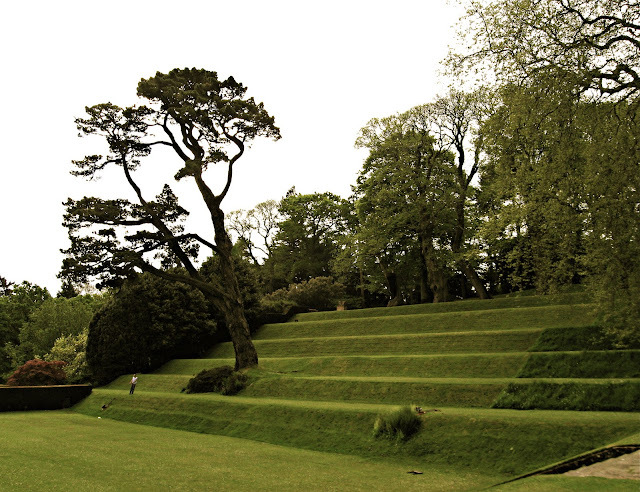 On Summer days we set up picnics on the grassy areas. We clambered over the rocks along riverbanks, sometimes falling into the water, one time a very close call for me at age three when an uncle pulled me out dripping and tearful. 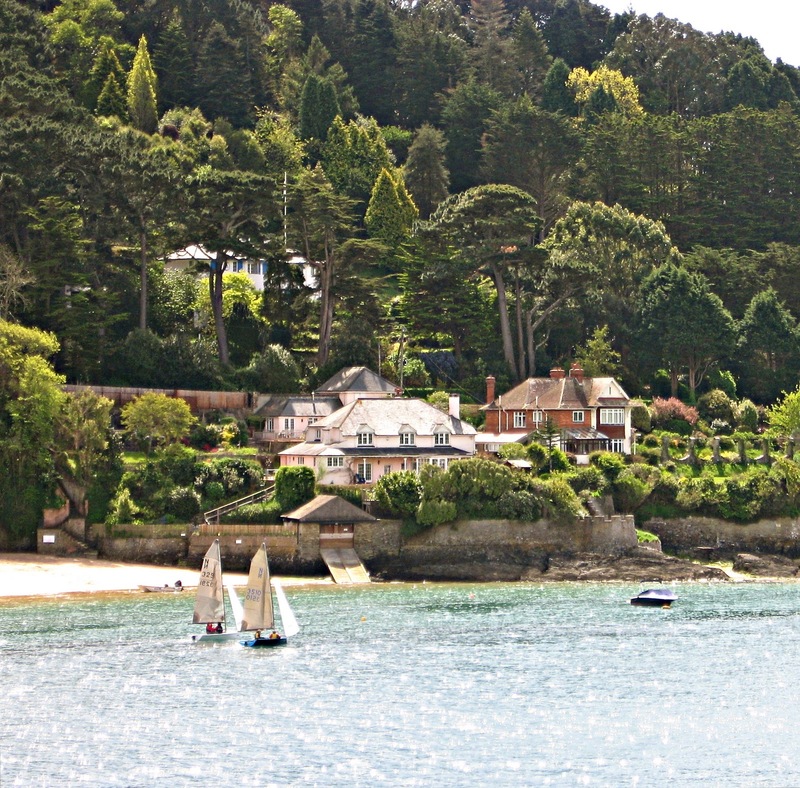 Sailing at Salcombe - pricey real estate, much of it, Summer homes owned by British celebrities. Devon has some beautiful river scenery, the loveliest probably being along the River Dart which flows from the high moor on Dartmoor, down to its estuary at Dartmouth. Late afternoon along a quiet river bank - old arched stone bridge. 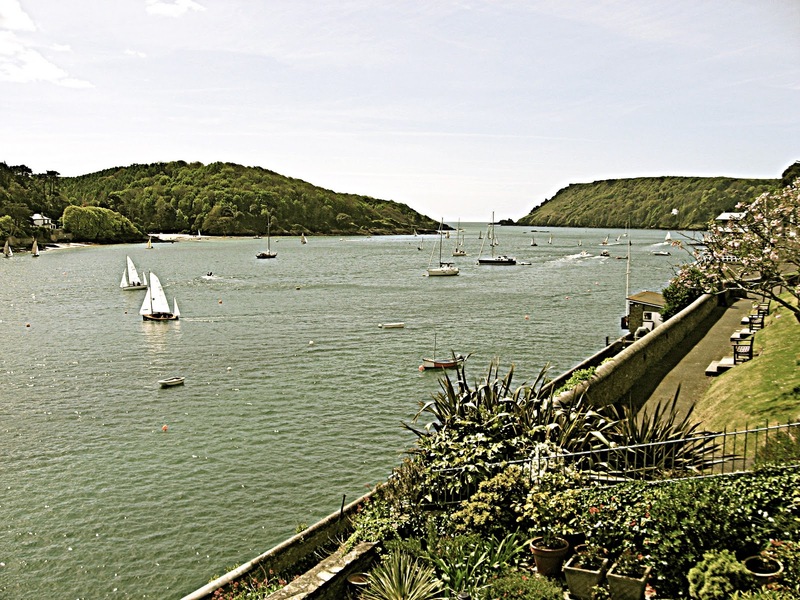 Salcombe, a beautiful historic boat building town where views of the Kingsbridge Estuary are spectacular. 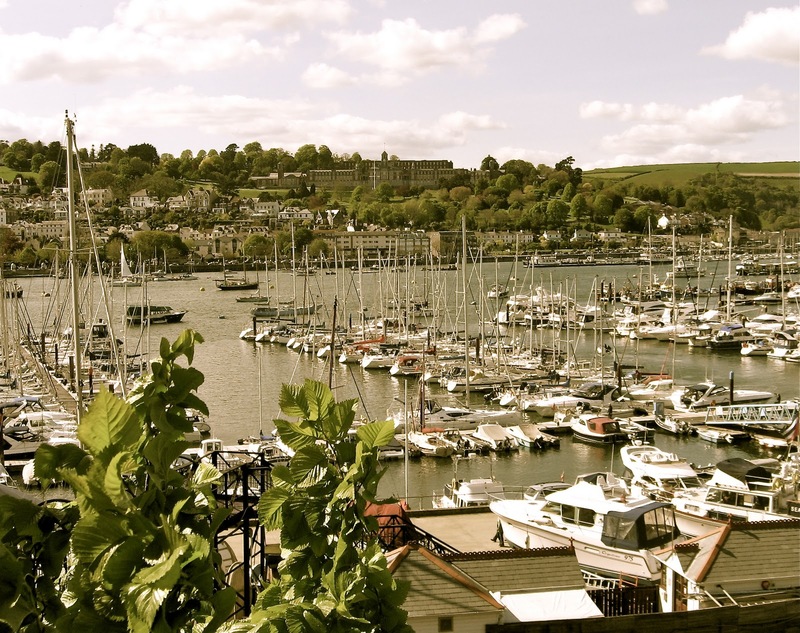 Dartmouth, the town at the estuary of the River Dart where Britain's Britannia Royal Naval College stands proudly on the hill. Now slated for possible closure because of defence budget cuts, the 126 acres along the river could be turned into high priced residential real estate, and another venerable institution of learning will crumble and fall. Britannia has been training naval officers since 1863, including the present royals - the Duke of Edinburgh - husband of the Queen, the Prince of Wales, and the Duke of York. 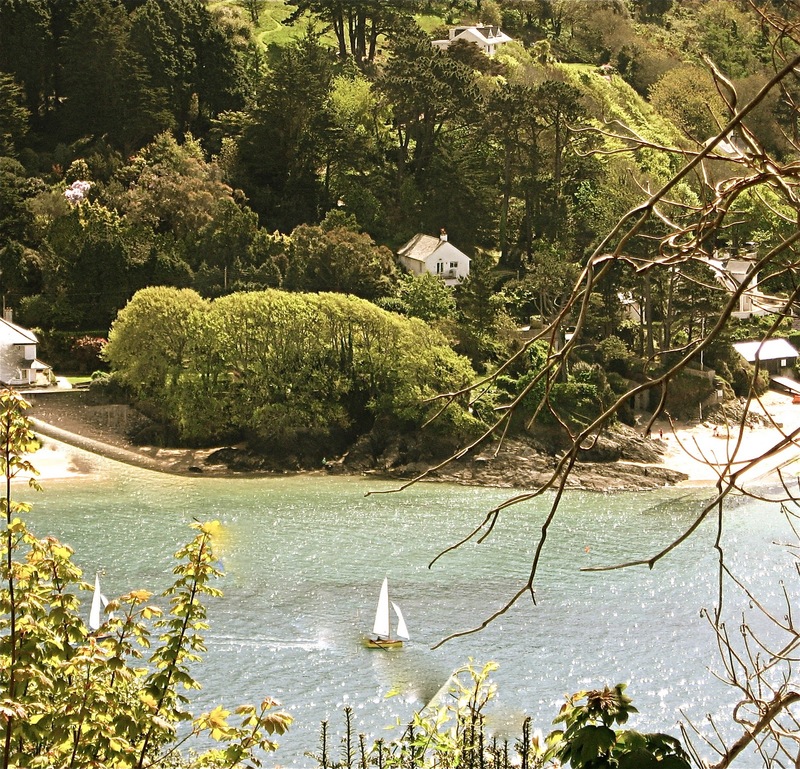 Looking across the River Dart from Dartmouth to Kingswear - boating is a popular pastime in this area. Later I'll share more images of the lovely town of Dartmouth - steeped in history, it's one of my favorite places to visit when home . Do you live close to a river? ..............sitting in the sunshine on the front porch having my afternoon cup of tea. What a special cuppa it was too - I even used my Grandmother's delicate Court China tea set - Murchie's Library Blend, from British Columbia, a thoughtful gift from dear blog friend Pondside who lives in Victoria, BC, one of my most favorite spots in the world! This was a new blend to me, most enjoyable, and a perfect accompaniment to the new copy of my favorite French magazine, Campagne Decoration, which arrived in the mail that same day. I actually don't use sugar in my tea but thought the little bowl with my silver sugar tongs looked sweet with the tea pot! Thank you dear Pondside for sharing a new tea, and the yummy chocolates.........thoughts of you far away in Victoria were definitely on my mind as I sipped.........hopefully we'll have tea together some day. Do you enjoy getting together with friends for afternoon tea? Although a British tradition, it appears to be getting quite popular here in the US. It's just lovely to take a break late in the afternoon before the dinner rush, sipping tea while chatting about the day. It's really funny how I seem to get really homesick..........just when I'm planning and preparing for a trip home! It's the excitement of knowing I'll be there again, seeing family and friends, walking on familiar turf, looking out across the blue bay, and reliving all those childhood days and youthful dreams. So what have I found myself doing? Looking back through all the many photos I took on my last trip to England which was Spring of 2009. I'm noticing how I like to take pics of steps. There are so many in my home town as it's built on seven hills. 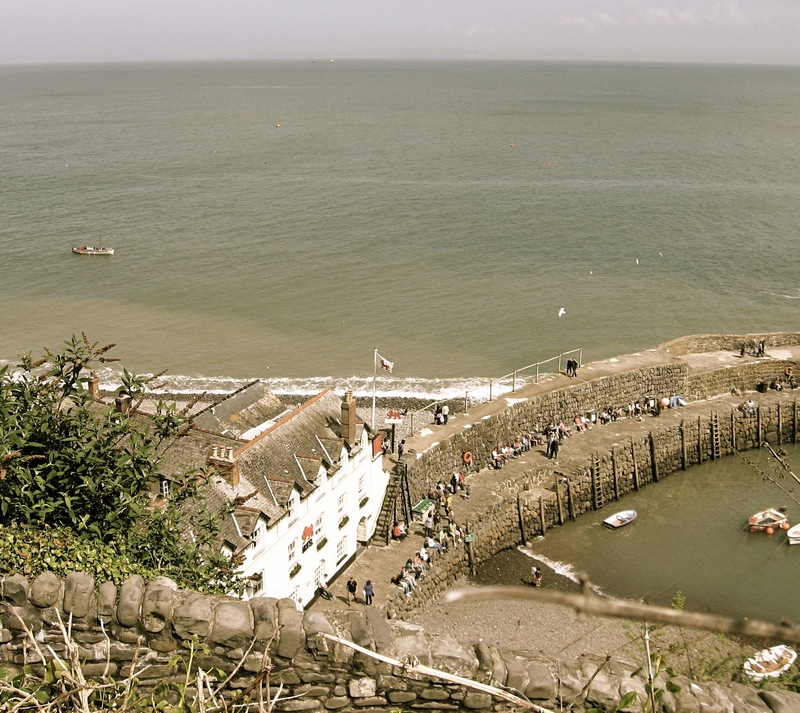 They climb up from the bay, some fairly steep, stacked with small hotels, guest houses, and B&B's, taking advantage of the sea views. 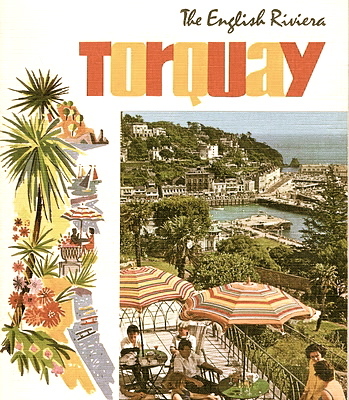 I love this cover of a vintage brochure for my town. I brought it with me in 1962 and was always proud to share pictures and stories of my lovely home. Not much has changed, but now there is talk of building a third harbor to accommodate cruise ships. This would bring a much needed boost to tourism, however, such huge changes take many years so I don't think it will happen soon. I decided to edit these pics to give them a vintage look. I know I've shared some of them before, so this is a second time around with a bit of a new take. Yes, palm trees do grow in parts of the British Isles! They thrive along the English Channel coast due to the warming waters of the Gulf Stream. 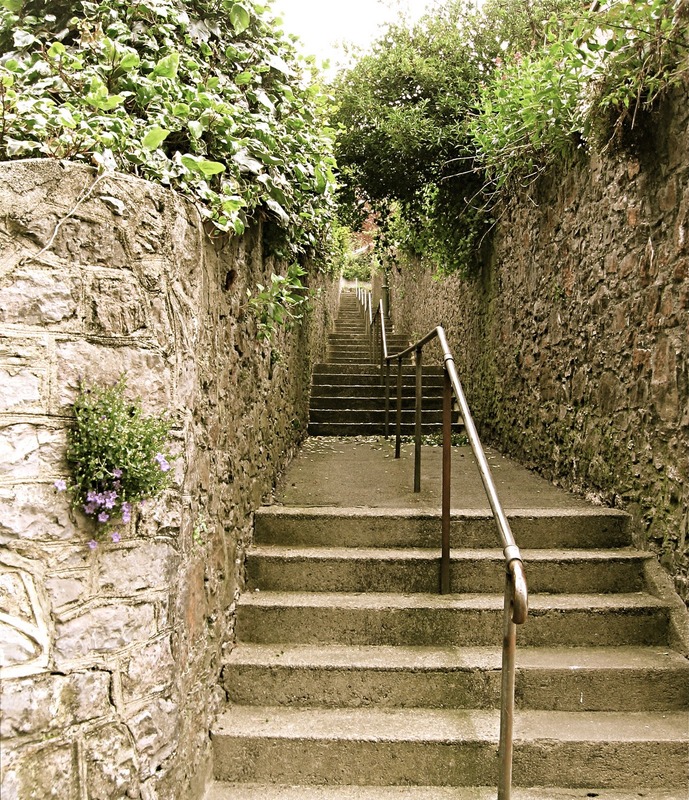 There are many steps such as these leading up the hillsides from town..........we had no problem getting exercise as children. No gyms were required in those days! ........which is where I caught students at the college there practicing dance steps on steps in the Spring sunshine. Cobbled steps in Clovelly - one of the steepest small towns on the North coast of Devon - a favorite place to visit. The walk down is hard, donkeys were used for many years transporting supplies up and down to cottage homes and the hotels at the bottom. Now sleds are utilized and there is a Land Rover service, for a fee, on the one road...........we walked down on this day but took the vehicle back to the top! ..............complete with tourists soaking up some sunshine. The large building is a hotel. Beautiful old fishermens' cottages under the hill on the pebbly beach. I always notice how the iron railings appear to have never been replaced as I step gingerly down onto the beaches of my childhood. Rusty and bent, they still feel the hands of excited children, as they have for so many years, off for an exciting day at the seaside. I'll be sharing more images from my home soon - hope you'll come along with me.